Beginning in 2016, Measure of America worked with the New York Times for nearly a year to develop a custom dataset that analyzes NYC high school graduation rates in a way that hasn’t been done before. Our original research informed a feature story that asked and answered important questions about school choice and how to ensure every student has access to the best education the city has to offer. The on-time high school graduation rate for New York City public school students has risen every year for over a decade, a significant accomplishment of which the city should be proud. Yet startlingly wide graduation rate gaps exist between different groups of students. Virtually every ninth grader who entered high school in 2011 on the basis of a successful Specialized High School Admissions Test (SHSAT) graduated four years later; in contrast, fewer than six in ten students admitted to educational option programs graduated on time in 2015. To address these disparities, it’s essential to look beyond the marquee numbers to determine which students are graduating on time, which aren’t, and what can be done about it. 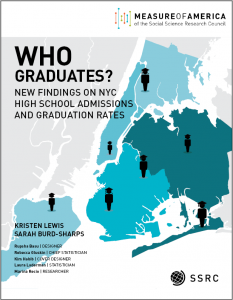 “Who Graduates?” uses a new dataset obtained by special agreement from the NYC Department of Education to look at high school graduation through the lens of types of high school programs students are admitted to. The mandatory high school choice system is a complex, high-stakes process that roughly 80,000 New York City eighth graders must navigate every year in order to gain admission to high school. It requires all eighth-graders to rank their top 12 high school program preferences from over 700 programs in 400-plus public high schools. 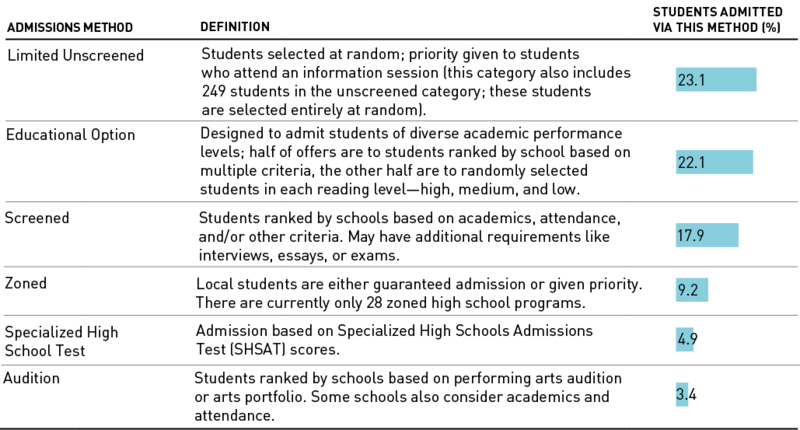 No neighborhood “default” option exists. Each program uses one of six admissions methods, which vary sharply in terms of competitiveness. This lens is critical because the high school choice process is hugely consequential for children and families. The report concludes that ensuring that our most able students get a good education, worthy goal that it is, is not enough. Average and struggling students also have the right to a high quality education; indeed, it’s in all of our interests to make sure they get it. A striking 97.4 percent of students admitted to high school based on the SHSAT graduated on time in 2015, compared to only 59.8 percent of those admitted to educational option programs and 68.1 percent of those admitted to limited unscreened programs. Educational option programs and limited unscreened programs together educate nearly 35,000 city teenagers. Overall, 16.6 percent of Asian American students were admitted to specialized high schools; only 1.1 percent of black students and 1.1 percent of Latino students were. Well over half of all black and Latino students were admitted to either an educational option or a limited unscreened program, compared to roughly one in five white or Asian students. Citywide, Asian Americans had the highest graduation rate (85.4 percent) and Latinos had the lowest (64.4 percent). But the largest gap by race and ethnicity was in the graduation rates of Native American (52.1 percent) and Asian American (81.6 percent) students assigned to educational options programs. Graduation rates varied by borough. The graduation rate gap between those students who lived in the borough with the highest (Queens, 77.3 percent) and lowest (Bronx, 63.7 percent) graduation rates was 13.6 percentage points. The distance between the highs and lows widened when we added the type of program, ranging from just 3.1 percentage points between Manhattan and Staten Island students admitted to specialized high schools to a 28.9-point difference for zoned programs between students living in the Bronx (47.2 percent) and students living in Staten Island (76.2 percent). The gap between the NYC community districts whose students were most likely to graduate, Bayside, Douglaston & Little Neck (92.3 percent), and least-likely to graduate, Hunts Point & Longwood (59.2 percent), was 33.1 percentage points. Our analysis shows clearly that certain groups of students are at high risk for not graduating in four years. Fewer than seven in ten black, Latino, or Native American students; students admitted to high school through the educational option and limited unscreened methods; students who lived in the Bronx and Manhattan overall; and students living in twenty-three community districts graduated on time in 2015. This analysis suggests that the city should look closely at educational option programs; four in ten students admitted to these programs don’t graduate on time. The philosophy behind the educational option approach is that bringing young people of different academic abilities together to learn produces better results, and ample evidence supports this view. In practice, however, too few top-performers choose educational option programs for these programs to work as they were designed to. SHSAT and screened programs skim off the the lion’s share of high-achievers, leaving comparatively few to fill spots in the educational option programs. The city should also target more support to black and Latino students who attend both zoned and educational option programs, whose graduation rates are below 60 percent. The school system cannot be expected to provide this support on its own; other city agencies, nonprofits, foundations, and businesses have important roles to play in addressing the myriad inequalities NYC families and neighborhoods face. A strong, safe, dynamic NYC depends on everyone having the skills they need to live productive, rewarding, freely chosen lives. Ensuring that more of our young people get their diplomas is good for all of us.